If you are like most people you have probably always wanted to try martial arts training but for one reason or another you just never got to it. Whatever the reason, it’s never too late to start. The most common reasons for seeking martial arts training are Self Defense, Exercise, Performance, History and Philosophy behind the arts, and sometimes just for the fun of it. In the case of Tai Chi Chuan, relaxation, stress reduction, and improved health are often cited as the main reasons for study although Tai Chi Chuan is also one of the most effective systems of self- defense. Our self-defense program is highly effective because it teaches how to use the opponent’s energy against himself. Not competing with an opponent on a force against force basis allows a much smaller person to be effective in defeating an attacker. Students will come to understand kung fu’s three levels of fighting and develop full power punches and kicks on targets, not people. Because we only use full power punches and kicks there is no free sparring in our school. Effective self-defense skills can be developed without injuring each other in the process. True self-defense is not a game and we do not teach it as such. 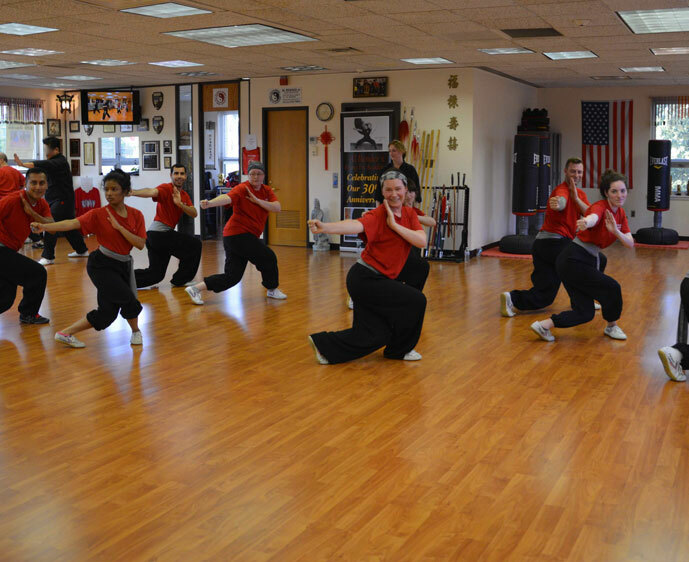 As an exercise form to lose weight, improve health, or just feel better physically, kung fu training approaches exercise differently from most western forms of exercise. Using a whole-body approach, the benefits of increased physical strength, greater muscular flexibility, improved blood circulation, and physical coordination are experienced. Additionally, this form of exercise focuses on conditioning the joints, ligaments and tendons that are often ignored and sometimes damaged by other exercise forms. Maintaining healthy joints can reduce the development and effects of Arthritis as well as other joint associated conditions. Increasing the metabolism is highly recognized as a significant way to burn fat and lose inches. 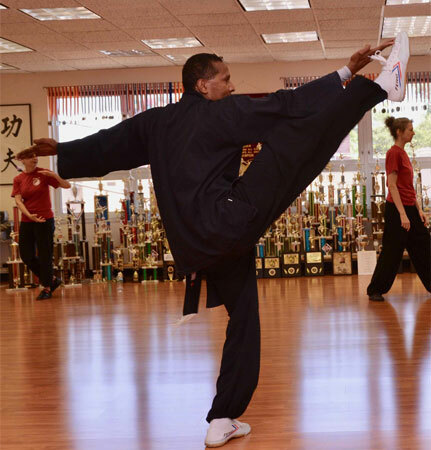 Kung fu training excites the metabolism and often succeeds in helping practitioners lose and keep off excess weight. Culturally rich, the history of kung fu includes the performance aspect of these aesthetically beautiful arts of body movement and control. Incorporated into Chinese Opera and Dance, movements from traditional kung fu styles make a significant contribution to these performance arts. The more modern version of kung fu known as Wushu (the national sport in China) is a gymnastic type performance of traditional Chinese martial arts. With jumping, spinning, aerial techniques and extreme flexibility as its focus, it places performance above all else. 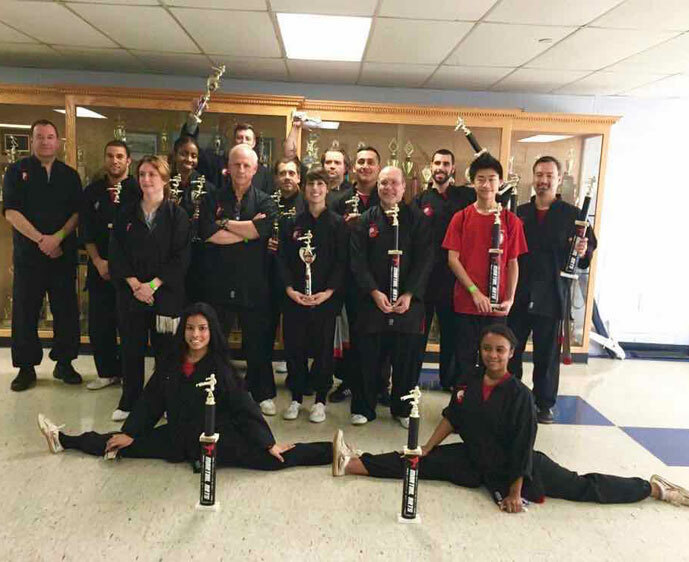 In keeping with the tradition of performance, Academy members are frequent Champions in martial arts tournaments, as evidence by the 200 plus trophies and medals on display at the school. The Academy also participates in fund raising performances for charitable organizations such as St. Jude Children’s Hospital and others. The history of Kung Fu dates back thousands of years. Originally developed as an exercise to improve the health and physical condition of the monks at the Shao Lin Temple, the style evolved into a form of self-defense through necessity. Because the temple in the mountains was unprotected from thieves that would roam the countryside, the monks found themselves constantly being victimized. 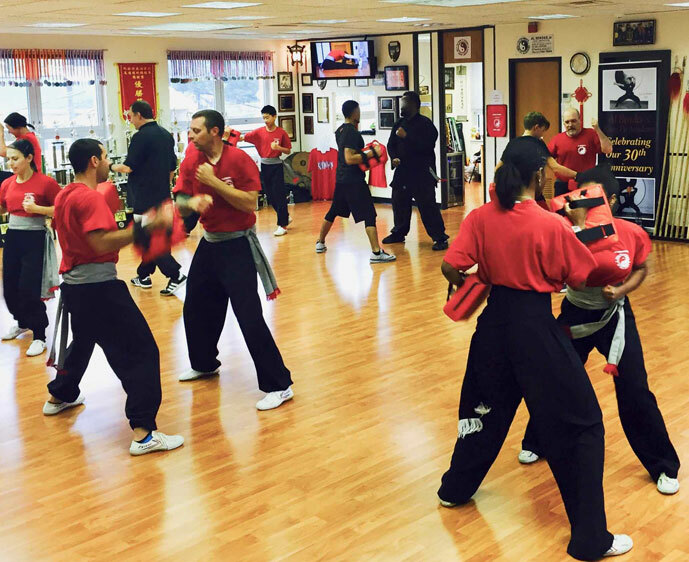 The need to defend themselves is what gave birth to the martial arts we teach at Al Bender’s Kung Fu Academy today.